"...they are the witnesses to this tragedy of incomprehensible dimensions that would devour the world." There's something truly stunning about seeing some of the most important moments of World War II in full, original color. 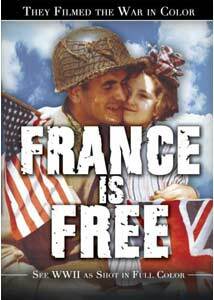 It sounds like such a simple thing, and it honestly hadn't occurred to me that They Filmed the War in Color: France is Free! would be anything more than a curiosity. We're so used to seeing everything from the era in black-and-white, though, that the footage is eye-opening. In the opening moments, I was stunned when I realized that I had never seen Adolph Hitler in color. I found a whole new level of immediacy in this footage, culled from national archives, private collections, and Hollywood studios, that brought aspects of the war home to me in new ways. There are many beautiful and joyous images of the liberation of Paris, and scenes of everyday life in Vichy France, but there are also moments of horror that the producers refuse to shy away from: cities razed to the ground, concentration camps, mass graves. In one moment, Hitler, in living color, stares directly into the camera during his only trip to Paris. He smirks slightly, and the narrator informs us that Eva Braun is running the camera. Chilling. Charles DeGaulle shows up, as does Edward G. Robinson, General Eisenhower, and President Roosevelt. Beginning with gorgeous and surprisingly high-quality footage from Joan of Arc Day in 1939, during which there were the only vaguest hints of the oncoming storm, we take a rambling tour through the occupation, resistance, and liberation. The clips used are from dozens and dozens of disparate sources, amateur and professional, and the whole thing could have been a hodge-podge, but the narration by Geoffrey Bateman, written by director Ren�-Jean Boyer, pulls the film together and draws connections that aren't always obvious. Non-obtrusive interviews from those who lived through it offer further perspective. The scenes of everyday life before and during the war are priceless in and of themselves, but there are many historic moments documented forever: Hitler tours a conquered Paris, D-Day, USO shows. Allied troops march through shattered cities. Much of France outside of Paris didn't make it through the occupation with its architectural beauty intact, and the question of "why?" is in the eyes of the sullen citizens who roam, zombie-like, lost, through cities, towns and villages�homes that are simply gone. This documentary comes from French television, but it's perfect for DVD. The medium provides a solid financial incentive for the preservation and restoration of the footage shown here, and it provides an outlet for those who want, and maybe even need, to see it. I haven't seen the companion DVD The Pacific War, but I look forward to checking out that one as well. While we can all argue about the efficacy of color as a filmmaking technique, there's no question that color documentary footage creates a very different level of immediacy. I can honestly say that I've never felt as close to the milestones of World War II as I did watching this documentary. Image Transfer Review: A poor image transfer could have killed this documentary, but thankfully they've done a wonderful job. The footage used itself varies in quality, but there's no digital artifacting, blacks are deep and rich, and the colors absolutely pop. I have no idea how much work had to be done to the footage to restore it to viewable quality, but the vast majority of it looks great. Audio Transfer Review: The Dolby 2.0 audio transfer is merely satisfactory. Most of the footage is, however, silent and lightly overlaid with music and narration, so the transfer is really as good as it needs to be. Extras Review: None. There was little discussion in the film of the technology that existed as early as 1939 to allow amateurs to film on the fly in full color. While it would have been a distraction in the main feature, a bit more technical background would have been nice to include as an extra. Alas. As a straight narrative about the occupation and liberation of France, this is surprisingly thorough despite the disparate and varied footage culled together. It's extraordinary, though, as a window onto a time and place that existed before many of us were born, but whose ripples continue to shape the world. I'm just grateful that this high-quality footage exists, and it's been packaged and presented in a way that's informative, entertaining, and artful.